Best menswear formally on O'Connell Street, Dublin. 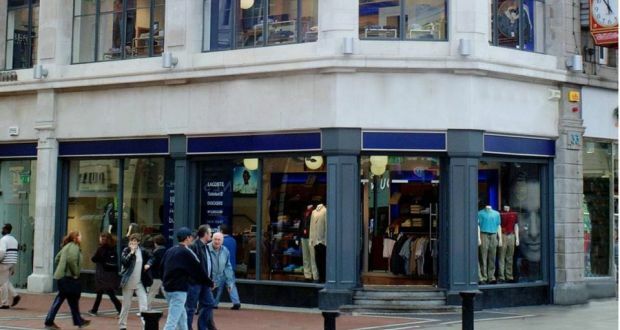 A survival scheme preserving 130 of 200 jobs has been approved by the High Court for the company operating Best menswear stores, along with other fashion stores, across Ireland. Best’s largest creditor, Allied Irish Banks, has agreed to write down more than €9 million off its €13.5 million debt and will continue funding the company after it exits examinership on Friday. Preferential and unsecured creditors will respectively get 10% and 5% of what they are owed while the remaining debt will be extinguished. Ms Justice Caroline Costello confirmed the survival scheme after refusing to direct examiner Declan McDonald of Price WaterhouseCooper to give the Revenue Commissioners detailed information underlying cash flow projections plus a detailed breakdown of the basis for some €289,000 fees agreed. Those involve €170,000 for the examiner and his lawyers and €119,000 for the company’s separate lawyers and its property advisers (relating to repudiation of leases). Seeking that information earlier, Jennifer O’Connell BL said Revenue, owed more than €700,000, wished to see the detailed information underlying the cash flow projections before deciding its position on the scheme. There was no breakdown of work done for fees which were substantial in the context of an €800,000 investment provided for under the scheme, she added. Garret Byrne BL, for the examiner, argued the Revenue application was unfair, unnecessary for a decision whether to approve the survival scheme and nothing more than a “box-ticking exercise”. The information related to the cash projections was commercially sensitive, the fees were reasonable and the Revenue had not suggested they were exorbitant, he said. The necessary objective evidence was before the court for its consideration of the scheme and AIB and the vast majority of creditors had voted in favour of the scheme, counsel urged. Rossa Fanning BL, for Best, said the Revenue’s application was wrong in law and “dangerous” because it could delay the company’s exit from examinership which it sought last July after the sudden closure of Clery’s department store had a “catastrophic” effect on its cashflow. Best was a concession holder operating its largest store from Clery’s premises. Mr Fanning said the Revenue has no superior entitlements over other creditors and does not have a “policeman role” among creditors.Â The court’s function was to consider the scheme as approved by creditors and it could not “unpick” that on the basis of alleged inadequacy of information. What the Revenue really wanted was to “second-guess” the professional fees and reallocate division of the €800,000 investment, he argued. This application seemed part of “a general campaign” by Revenue concerning fees of professionals. Refusing the Revenue application, the judge said the Companies Act requires, when deciding on a survival scheme, the court should have the “appropriate” information to decide the matter and she considered the court had that information. The additional information sought was commercially sensitive and while she had no doubt the Revenue would keep it confidential, that was not the test. Rather, the additional information was not before creditors meetings when they approved the scheme and, although the Revenue raised these issues at the meetings, it was “significant” creditors supported the scheme. The information was made available to AIB and she had “no doubt”, given the amount of debt it agreed to write down, it had scrutinised matters. This was not a failed examinership where the court would scrutinise fees and it was not suggested by Revenue the fees here were “surprisingly high”, she said. While Revenue suggested the level of fees would reduce the dividend for creditors, the court could not unpick a survival scheme in this way. Confirming the survival scheme, the judge said, while it involved writing down creditors liabilities “in a significant way” and Revenue would get significantly less” than in other examinerships, she was satisfied the proposals were fair and equitable. If the company was liquidated, there would be “nothing left” for anyone except AIB. The judge said she had “every reason to believe” the company will benefit by the existing management remaining and being involved in the investor company. This company was properly run before it got into difficulties not of its own making but due to the economic crisis, she said. The company has always been tax compliant and the cash flow projections for it during examinership were exceeded by 50%.